Helen Honeycutt is just getting her life back on track after a bitter divorce when she meets Emmet Justice, an attractive widower still grieving for his late wife, Rosalyn. Their sudden marriage sets off a maelstrom of resentment and ill-will among Rosalyn’s family and friends. Hoping to mend fences, the newlyweds plan a summer at Moonrise, Rosalyn’s historic estate in the Blue Ridge Mountains. 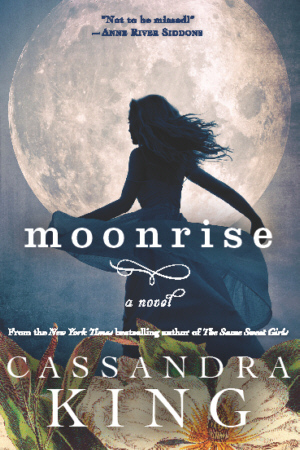 Moonrise is known far and wide for its unique nocturnal gardens, which have fallen into ruin since the death of its mistress. Like the heroine of Daphne DuMaurier’s classic romance, Rebecca, Helen becomes obsessed by her predecessor, who lives on in her house and gardens and the hearts of those who loved her. Not only does Helen fail to measure up to the beautiful and accomplished Rosalyn, she doesn’t fit into her world, either, an elite enclave of well-to-do summer people. Even the gardens exclude her, since their secrets, passed down by generations of gardeners, died out with Rosalyn. When it becomes clear that someone in Rosalyn’s close-knit circle of friends is determined to drive her away, Helen wonders if she can trust anyone, even her husband. As the sweltering summer draws to an end, Helen must uncover the secrets of the past in order to establish her own identity apart from the woman she replaced.